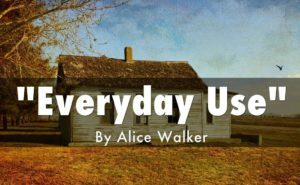 Everyday Use by Alice Walker is an anthologized shorts story that describes the relationship between a mother and a daughter. Walker explains how African American women use the family bond for identity in enhancing their relationships. The author uses humor to describe the daughter’s zeal towards reclaiming her heritage. Dee is interested in cultural nationalism. She overlooks American experience and insists in embracing her African traditions. The speaker in the story is the mother of Dee and Maggie. Dee has become sophisticated because she has managed to attend school. On the other hand, Maggie is old fashioned and embraces traditional life since she has spent most of her time with the mother at home. Therefore, the author of Everyday Use, Alice Walker has used heritage to describe conflict in family relationships. The central theme of the story concerns heritage. It concerns how a person can understand his or her present life and relate it to the traditions and culture of his people. According to the author, Dee believes that Maggie and her mother are not conversant with the traditional heritage. Dee accuses her mother and Maggie of their plan to put priceless heirloom quilts to everyday use. On the other hand, Dee is equally confused. She does not understand the nature of inheritance from her extended family and the nuclear family. Dee has decided to choose a new name Wangero Leewanika Kemanjo to conform to her African traditions. She is avoiding America names which are a sign of oppression. Such names are associated to black slaves. On the other hand, her mother believes that Dee symbolizes family unity. She adopted this name during the Civil War. According to her mother, Dee is a significant name since it belongs to an individual who was loved by the family. Dee does not understand the meaning of her heritage. She has a negative attitude toward household items and quilts. She does not want to use the names of her immediate ancestors. In this case, Dee is confused. She values the handmade goods including hand curved benches. These items were made when their family could not afford to purchase chairs. She is confused about the meaning of heritage. Dee has rejected part of her heritage by refusing to adopt the names of her immediate family members. According to Dee, such artifacts do not symbolize oppression since they are aesthetic objects. The love for the handmade objects is a cultural trend that does reflect Dee’s sincerity with her natural heritage. Before she went to college, she rejected a quilt offered to her since she considered them as old-fashioned. She disregards her heritage by refusing to learn about family skills such as sewing. She conceptualizes only the African traditions she shallowly understands. The basis of Dee’s is based on a culture the culture that predates slavery and the history of her family in the United States. She declines to use the Dee and changes her name to Wangero without understanding its meaning. She is not aware that she was named after her loving aunt, Dicie. She also changes her dressing style to match her African tradition. Alice Walker criticizes Dee’s imagination of heritage. Walker considers her view of heritage as cold and hurtful. Dee is attempting to make the lifestyle of her mother and Maggie to conform to the past. However, she is mean in her imagination since she considers her sister as uninformed and misguided when she appreciates her family history. On the other hand, Maggie and Mama have an alternative view of heritage. They consider heritage as part of their everyday life. They believe that heritage is something which is fluid and altered to suit the prevailing circumstances or conditions. They appreciate their immediate family traditions. However, they do not have higher knowledge or education concerning African traditions. For instance, Mama and Maggie appreciate their house, family heirlooms, and traditions. Dee is interested in displaying the quilts as art while Maggie wants to put them to everyday use. She wants to use them as blankets. This was their intended purpose according to the African traditions. Maggie is interested in keeping the family traditions alive, unlike Dee. Her grandmother taught her how to sew and can add to the family collection. In this regard, she can pass her skills to the next generation. Mama has awarded Maggie with the quilts instead of giving them to Dee. This is a reflection that she does not conform to Dee’s view of heritage. Dee has an idealized view concerning heritage while Mama believes that heritage is dynamic and continues to develop. Mama and Maggie have adequate knowledge and education concerning African roots. Besides, they have not deviated from their immediate traditions as opposed to Dee. In this regard, they understand the reality and significance of heritage. Therefore, Dee is ironic when she states that Mama and Maggie are not in conformity with their heritage. According to Walker, it is Dee who has lost touch with her family traditions and way of life. Alice Walker explores family conflict through of education. She considers the benefits of education as well its trade-offs in creating family conflicts. According to Walker, education can change a person’s way of life. Education can empower people both financially and materially. Education is the primary cause of conflict between Dee and Mama. Education has enabled to Dee to gain social and spiritual transformation. Through education, Dee has managed to acquire materials things such as sunglasses, gold earrings, and a camera. Education also helps Dee to resist racism. She changes her name to Wangero to allow her to subvert racist history. She acquired this knowledge by learning about African culture. However, Dee’s education is not uniformly positive. Her education does not help her to liberate her family from racism. Her mother considers her attitude as violent towards her family. She refuses to stay with her mother and opt to stay alone. Education has made her consider Mama and Maggie as inferior. According to Walker, Dee’s education was responsible for the fire that burned their house. Walker utilizes the word in the story. This word depicts Dee and her education. Her education traumatizes Maggie and Mama just like the fire that burned their house. 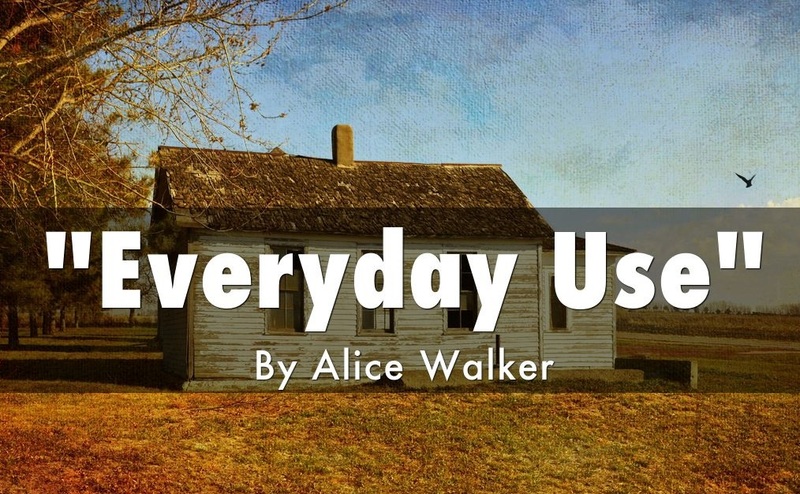 The story Everyday Use by Alice Walker has utilized various concepts of literary techniques to analyze the characters. The story contains both protagonist and antagonist characters. Mama is considered as a dynamic character. At the beginning of the story, she gives in to all the demands of Dee. However, at the end of the story, she stands her ground and refuses to award Dee with the quilts. Walker describes Dee as a static character. She is pessimistic and negative about her family throughout the story. Dee is described as the round character in the story. She is selfish and vain. She only cares about herself. She only thinks for herself concerning family blankets. For instance, Dee stated that “Maggie would put them on the bed and in five years they would be in rags.” Maggie is considered as a flat and dynamic character in the eyes of her mother. Irony has been utilized in the story to enhance understanding of the text. Throughout the story, Dee believes that Mama and Maggie do not understand their traditional heritage. However, in a real sense, it is Dee who is confused about her family heritage. Walker has used Quilt to symbolize the bonds in family generations. In the story, the quilt was stitched during the civil war by the family members. Mama refuses to give the quilt to Dee since this will end family traditions. She awards the quilt to Maggie she knows how to sew and can pass the family heritage to the next generation. Simile has also been used in the story. For instance, “my skin like uncooked barley pancakes.” The narrator uses this simile to illustrate her strong sensory details and shows that she is an African American. In conclusion, Alice Walker depicts Mama and Dee as antagonists. They have a different view of heritage. Dee did not understand the meaning of his family heritage and did not learn the art of sewing from her grandmother. As such, she cannot put the family traditions in everyday use. Maggie understands how to make quilts. Therefore, she can pass the family tradition and bond from one generation to the next. Eagleton, Mary. “Introduction.” Figuring the Woman Author in Contemporary Fiction. Palgrave Macmillan UK, 2005. 1-14. Harris, Trudier. “Alice Walker’s” Roselily”: Meditations on Culture, Politics, and Chains.” The Southern Quarterly 54.2 (2017): 28-48. Jing, Nan. “On the Ecological Feminism of Everyday Use.” Journal of Suihua University 6 (2014): 016. Walker, Alice. Everyday use. Films for the Humanities and Sciences, 2004.